S is for St. Patrick's Day, too. We spent the day doing housework and regular schoolwork. 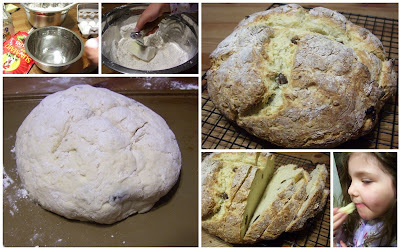 But, tonight after dinner, we found a recipe online and made traditional Irish Soda Bread to celebrate the holiday. St. Patrick was English, born there in 385. He was kidnapped as a teen. He was kept as a shepherd-slave in Ireland for several years where the druid religion was popular. 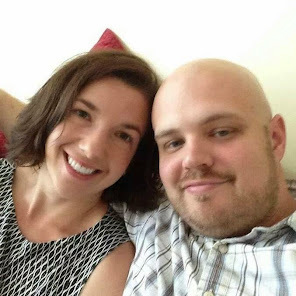 He escaped back to England where he studied to become a minister of the Christian faith. He returned to Ireland and began converting people to Christianity in 433. It is said that he used the three leaf clover to teach people about the Trinity. He was eventually made the Bishop of Ireland. He died in Ireland on March 17, 461. People remembered him on the day of his death year after year. Before there was a more formal process like there is today, sainthood in the Catholic church was often based on popularity or general respect of the people. On March 17 every year, Lent restrictions were suspended to celebrate the life and ministry of St. Patrick. People could drink alcohol and eat meat on that day, making St. Patrick even more popular among the common man, no doubt. With the Great Potato Famine of 1845, almost a million Irish Catholics came to America so they wouldn't starve. Faced with severe prejudice, they found it hard to get good jobs, stayed poor and tended to settle in groups within cities. Due to limited resources, Irish soda bread became a staple among the people since it can be made with only the most basic ingredients: flour, bread soda, soured milk and salt. Immigrants decided to take to the streets of NYC to celebrate their heritage on St. Patrick's Day. They were depicted as wild drunkards in reports, leading to some of the stereotypes Irish still face today. But, the St. Patrick's Day parade is the oldest civilian parade in the world and the largest in the United States, even bigger than Macy's Thanksgiving Day parade. Note to self: Maybe we should drive down to the city and see the parade in person some year. And, until now, I'd dismissed Norah and hadn't realized why she said "a man wearing a beard and a fuzzy green hat" delivered our mail this morning. I guess the mail man was celebrating the holiday in his own way, too.